Under the motto of “Present, Past and… Future??? 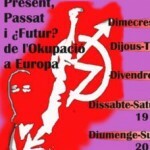 of Squatting in Europe”, some squat collectives of Barcelona organize a meeting the 17, 18, 19, and 20 of june to debate about historical, political and legal aspects of this movement in a european perspective. So this is a calling to all collectives, projects or houses across Europe who are interested in participate to come and give an own view of your experience and situation in your city or country. In the development of the meeting, simultaneous translation equipment will be provided to everyone. The meeting will be held in the “CSO La Forsa” (Avenida de la Fama 41, Cornella de Llobregat – Barcelona). The names of the three bank workers who died in the Marfin bank branch that was set alight have been announced. They are Paraskeui Zoulia, 35; Aggeliki Papathanasopoulou, 32 and Epameinondas Tsakalis, 36.